We are ablazin hot in these parts, so I need to show a little or a lotta leg in Texas this time of year. 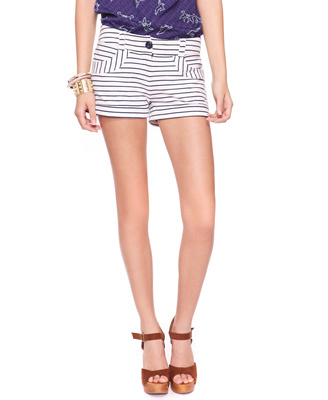 These are on the tad bit teeny weenie side of shorts for me, but A-DOR-ABLE. I have no idea what kind of striped flavored crack these advertising execs have put out there, but I’m smoking it. That’s for sure. It’s an addiction. And for $13.50 I think I can make the investment.